Located in the heart of Floral Park Village, just a block from the Long Island Rail Road, Jameson’s Bar & Grill established itself as an authentic Irish pub in 1998. Jameson’s features a premium bar with a broad selection of imported and domestic ales, single malt scotch and a friendly poured pint of Guinness. Our wine list offers the perfect complement to any meal and please ask about our specialty drinks. The decor at Jameson’s is a classic design of Irish memorabilia with bag pipes, photos of the Doors of Dublin, a genuine set of clay pipes and of course, an original Jameson’s Irish whiskey barrel. With flat screen TV’s throughout, you’re always sure to catch the latest sporting event and some good conversation. Come in, take the chill off and sit by our cozy fireplace or enjoy our newly designed outside courtyard for dining and drinks. Our friendly staff is here to welcome you after a hard day’s work or after a local softball game. Come with your friends to celebrate birthdays, retirements, bridal or baby showers, life in general or even to raise a glass to honor a friend in the typical Irish way. According to Newsday, Jameson’s chicken pot pie “is a standout”. Come see for yourself! Our menu offers appetizers such as Bacon Wrapped Scallops and our entrees range from Shepherd’s Pie to Grilled Atlantic Salmon or try our signature Jameson’s Marinated Skirt Steak which is grilled to perfection! Our chef offers nightly specials and don’t forget to check out our special Prix Fixe menu. After dinner, enjoy a fresh brewed cappuccino and a selection from our delicious dessert tray. With plenty of parking, Jameson’s is the ideal location to host your next personal or business event. Catering is available for up to 100 guests on and off premises. 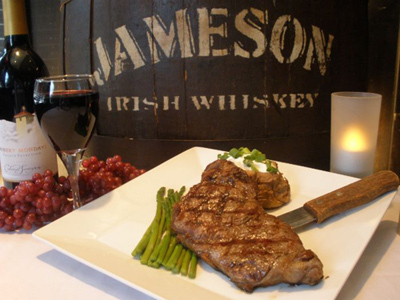 Please contact our catering manager at (516) 326-8300 and let Jameson’s take care of the rest.